There are several locations in the UK that are great for fishing, and many of these are relatively unknown to the average person. In this article, we round up some of the best fishing locations, plus a few of the best places to take a fishing holiday in the UK. Draycote Water is a good place to go fishing in Warwickshire. It is a large reservoir that is famed for being one of the UK's leading trout fisheries. Rainbow trout and brown trout can usually be found in abundance here. Boat and bank anglers can enjoy fishing throughout the season from March through to October. For fishing holidays, Arden Fisheries is a good choice. Camping is possible here, but most people choose to stay in the rather more luxurious 5-star accommodation at nearby Sykes Cottages. The North Tyne river is another good place for fishing, especially for salmon. The Tyne is now seen as one of the best rivers in the UK for salmon fishing. The salmon in the river tend to be fairly large, and in line with or above the average size. The Riverdale Hall Hotel is responsible for overseeing much of the fishing in the river. The Lonsdale Country Park (Carlisle)has seven lakes on which you can enjoy some of the best angling in the North of England. There are also luxury holiday homes (on a country estate) that you can stay in as part of your fishing holiday. Dungeness Beach is one of the UK's leading beaches for cod fishing. In the past, large cod were typical, but these days, an average size cod is much more likely, although there is scope for catching a cod weighing over 20lb (if you're lucky!). Bass fishing is also popular here towards the end of summer and the beginning of autumn. Flatfish fishing is also a possibility on this beach. Orford Ness is a shingle bank that offers cod fishing in the winter, and bass fishing in the summer. Throop Fisheries (Dorset Stour in Bournemouth)offers a good alternative to fishing in rivers. Chub and barbel fishing are popular here. Willow Park Fisheries (Ash)offers the chance to fish for different kinds of stillwater fish. There are three different lakes here, and bream and roach fishing are popular. The Celtic Lakes Resort (Lampeter)is great for 'big fish' fishing holidays. Accommodation comes in the form of 16-century farmhouses and luxury lodges situated by the side of the lake. If you're looking for the personal touch on your fishing holiday, the Holgan Farm Fishery might be just what you're looking for. It's run by a husband and wife team, who offer home cooking, as well as the School of Angling, at which top anglers offer their expertise to both new and experienced anglers. 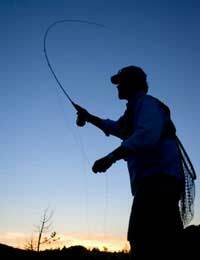 Nine Oaks Fishery (Cardigan Bay) offers coarse and trout fishing. For fishing holidays, there are apartments and caravans, with the former being given a 4-star rating from the Welsh Tourist Board.